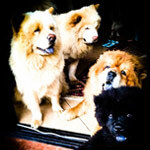 Do you have a tip how to remove the ticks and fleas to my chow chow? I'm getting frustrated here. I already used frontline but It can't kill all of the ticks and there are lots of eggs of fleas. So annoying! Advocate from Bayer is doing a better job than frontline. Make sure your getting the right dose acc. to the weight of your Chow. Frontline as well as Advocate have to be given monthly, every ! month. If the Chow is already infested it can take two to three month before all ticks and flees are dead and no new are hatching. wait one week after application of frontline or advocate before first bath. finally manual removal and drowning of removed ticks helps too. I use the chews from the vet every month(don't remember the name. It kills them when they bite. I also spray her with a weak peppermint oil and water mix every few days to repell them. It works well as we live in the woods.